Set diamond abalone into headstock, used knife to square out after drilling round holes. Set with clear epoxy. 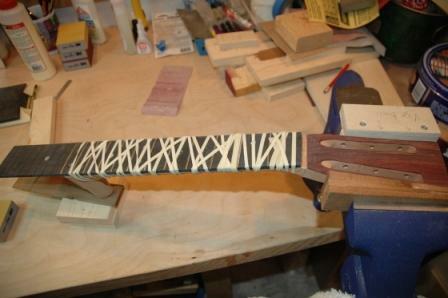 Worked on fitting the neck, then added remaining frets. 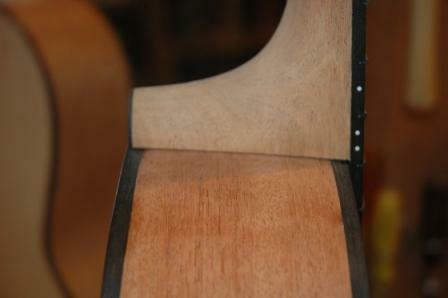 Some frets wouldn’t seat fully, and had some chip out. Don’t know why, and can’t learn any lessons other than I need to make sure I fully seat frets before gluing final step. 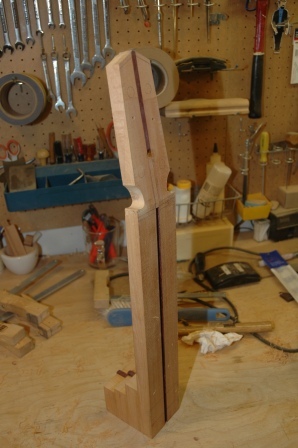 Mill filed fret ends, used fret angle file block to angle the fret ends. 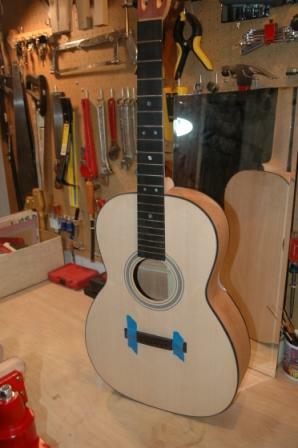 They will need some cleanup and dressing, which I will do just before gluing the neck on. Worked in Rob Girdis’ shop on February 2nd to get some dovetail joint advice. John, another workshop participant gave me some advice, which I applied. It was very similar and reinforcing of the instructions from Stewmac. Masked the soundboard and the fretboard and 220 grit sanded all mahogany. Applied stain, 200 drops of Red Mahogany in 4oz. of water, and applied to body and neck. Did not mask the binding, but next time I should. Made a spray booth in my workshop with garbage bags and sprayed a post stain lacquer wash coat to seal the stain. Did not anticipate the noxious fumes from the spray lacquer. Whole house reeked for several hours after spraying. Hmm. What’s the alternative? My family threatened to dispose of me if I didn’t come up with an alternative to spraying the lacquer somewhere else besides in the house. The garage is chock full of stuff and isn’t a reasonable alternative as fumes will still get into the house. So I started thinking of outdoor spray booth constructions, something portable, something that could be heated, wind resistant, and rainproof. We have a big old camping tent that started to look like the answer. I bought some high heat portable work lights, set up the tent in the back yard, rigged a painting scaffold on a ladder and purchased myself a respirator, and found this solution too be ideal. Through February 18, I have applied 6 coats of lacquer, and the guitar and neck are scuff sanded to release trapped lacquer in preparation for the next 6 coats to be applied in 2 days. 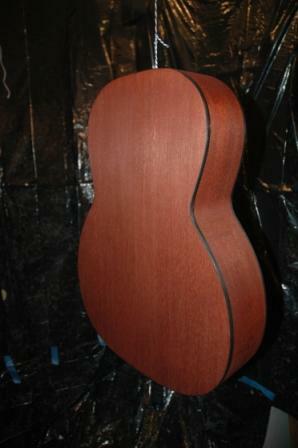 After the final six coats and some wet sanding, the guitar will have to sit for 2 weeks for the finish to cure. The guitar finally received 12 coats of lacquer on February 23rd. 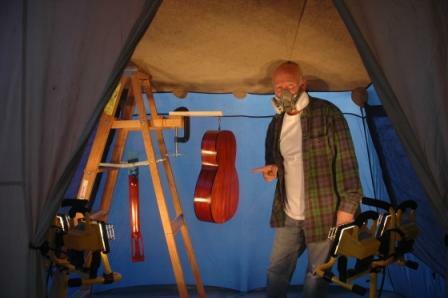 Took down the spray booth and put the guitar in my workshop to cure. I lightly sanded with 600 grit and removed all rough spots. Will begin the wet sanding and polishing March 8th.